Let me start this blog out by saying that I'm a little out of my element here- I've literally had the same broken, nasty, missing-mirror eyeshadow palette since my Freshman year of college. Which has certainly been a hot minute. Haha! BUT I am really trying to up my makeup game and do so in a way that is both practical and affordable because hot dang why is makeup so expensive sometimes?! 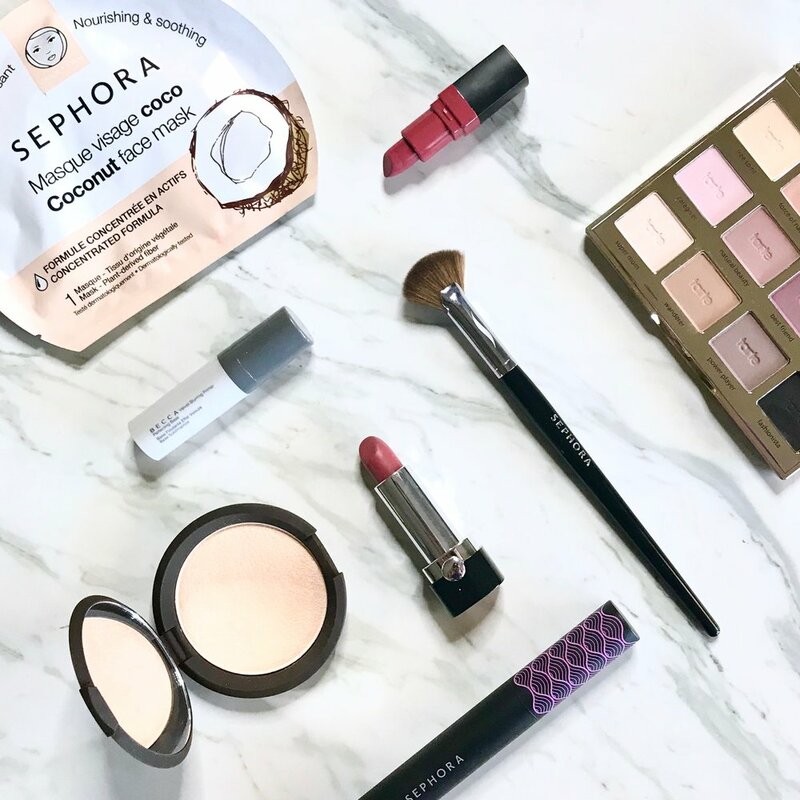 So, whether you are a makeup guru or just someone wanting to add a few new basics, I've got great news for you: The Sephora Beauty Insider Sale is happening NOW. That means you can get up to 20% off store-wide if you are a Sephora Insider (which I highly recommend if you aren't because you get amazing freebies all year with their program- in fact 2 of the items pictured above are wonderful freebies I received!). 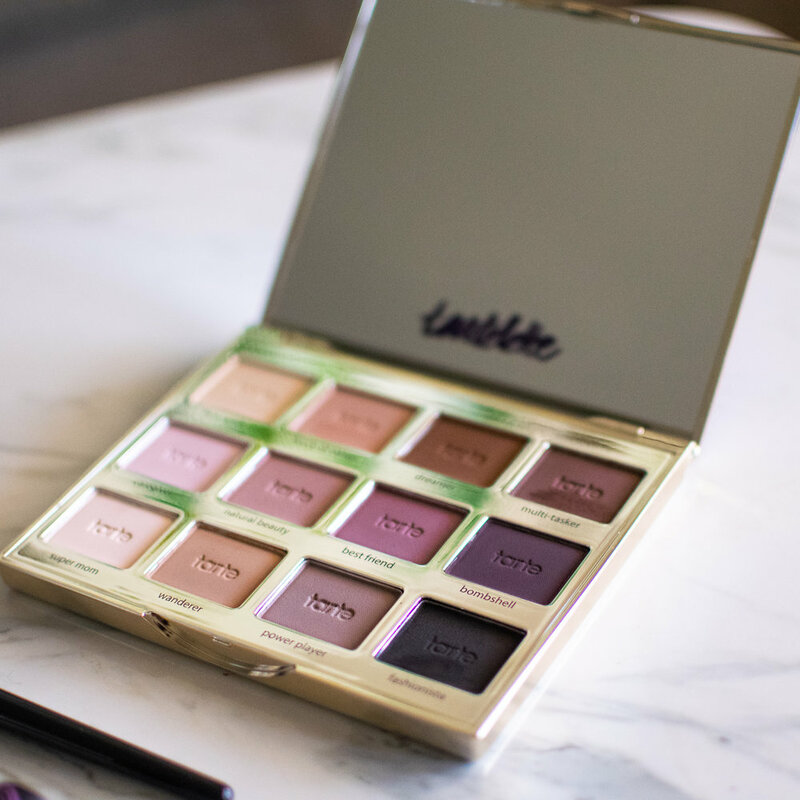 This tartlette eye shadow palette was my favorite purchase by far! As I mentioned before, I have needed a new one for sooo long, and this one is just perfect. I'm kind of an anti-sparkle kind of person when it comes to make-up, and this gave me all the neutral colors I was looking for in a matte finish. I've been wearing it for about a week now, and they have stayed on really well throughout the day! To the shock and horror of everyone who knows all the things about makeup, I actually have never used highlighter before now. And also maybe wasn't that sure what it was. Thank God for a good momma who's always looking out for my face! ;) At her recommendation, I tried this one out, and guys, I basically have a whole new face-Haha! I've never seen my cheekbones in such a way before! The color I got is called "moonstone", and it was perfect for my pale skin tone. I also got the highlighter brush on this shopping trip, and it's made life easier. Now lipstick- this is where I really shine, cheesy pun intended. 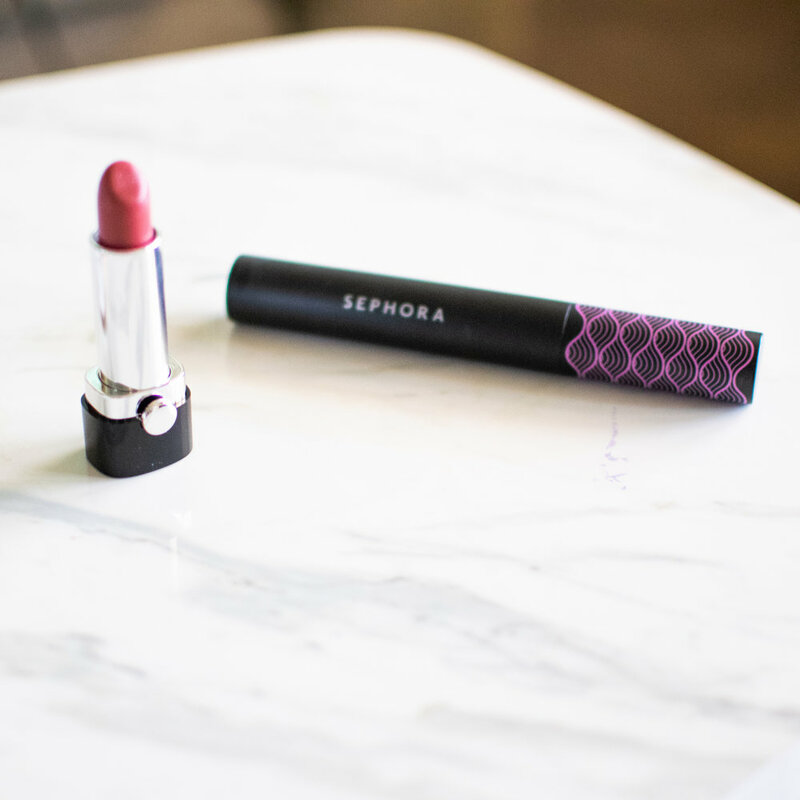 ;) Lipstick has been the only piece of makeup I've ever spent much money on or invested much time into because it's like a fun accessory picking a shade that matches my outfit for the day! I discovered Marc Jacobs lipsticks from a previous Sephora freebie and have been obsessed ever since. I'm a freak about how lipstick feels when I put it on- there can be absolutely no stickiness, and I want zero sparkle. Marc Jacobs checks all my boxes and also has tons of fun colors. I picked "sugar and spice" this time because I wanted something a little darker for fall, and I'm really pleased with it! I also use the Sephora brand "big volume" mascara- it's only $14. Is it the best mascara in the entire world? Probably not. But I have been blessed with HIGHLY allergic eyelids, and for whatever reason, this is the ONE brand that doesn't puff my eyes up like a weird, old balloon so that is the best I can ask of any eye makeup. I do also think it's a great mascara for the price though. Click the video below to see some of this makeup in action and hear our full descriptions! And also to listen to me laugh at my husband a whole lot! ;) Subscribe to our channel to see more of our exclusive YouTube content!